In need of a gorgeous vegetarian Christmas main that’s easy to make and can be prepared in advance? 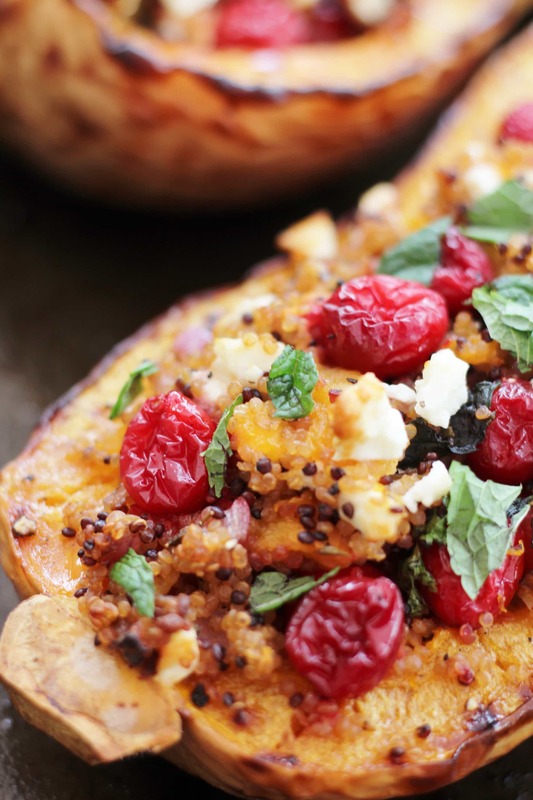 This Cranberry, Feta and Quinoa stuffed Butternut Squash could be exactly what you are looking for! It’s also gluten free, can easily be adapted to make it vegan and dairy free, and is chock full of goodness!! There is something just totally wonderful about the combination of mint, cinnamon and cumin, use it to flavour quinoa, add some feta and cranberries and stuff it into a butternut squash and you have something totally awesome on your hands. 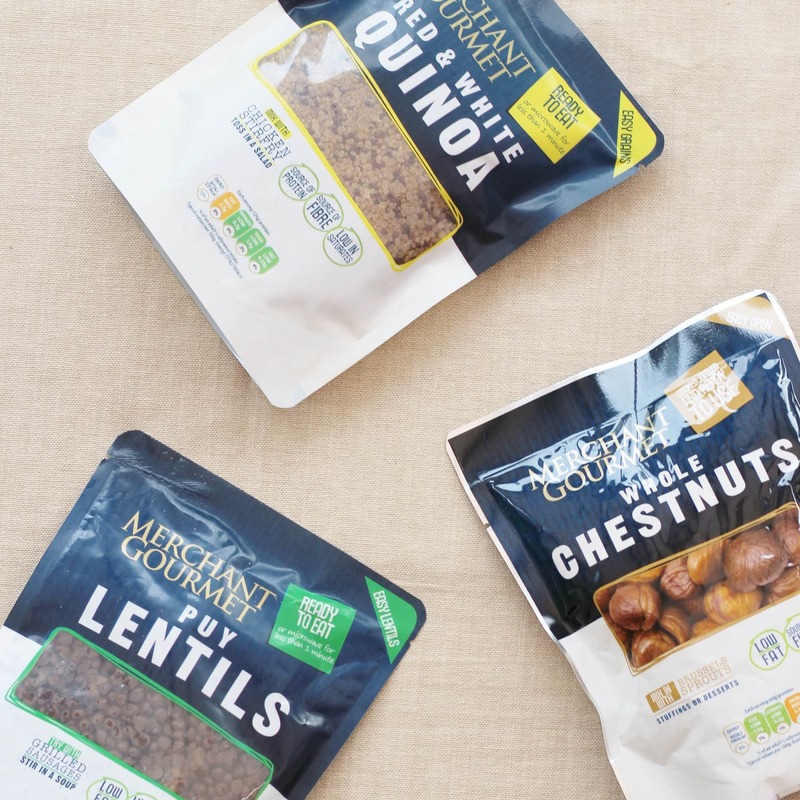 I am a huge fan of these Merchant Gourmet ready to eat packets at the moment and the red and white quinoa is one of my favourites. Quinoa is not exactly hard to cook (boil for 10-15 minutes and drain), but sometimes it’s helpful to have an even easier shortcut, especially at Christmas time when there is so much else going on! Using a ready to eat pack of quinoa in this recipe makes this dish a really speedy one to assemble – less than 10 minutes of hands on time and the rest of the time it is in the oven, doing its thing. This Cranberry, Feta and Quinoa stuffed Butternut Squash is also a great make-ahead recipe, because it is really easy to reheat the next day. Simply place the stuffed butternut squash in a cold oven, turn the oven up to 180C and heat for about 20 minutes until piping hot all the way through. I originally conceived this as a great veggie main – perfect for any day of the week, but especially Christmas Day. But if you are not veggie, it would also make a great side dish – perhaps as an accompaniment to leftover ham or turkey on Boxing Day. If, on the other hand, you need this to be vegan or dairy free, simply swap the feta for a handful of pistachios, pecan nuts or walnuts (or even a combination of all three!). I really like the tartness of fresh cranberries, but if you prefer a sweeter taste use sweetened dried cranberries instead. If cranberries aren’t your thing, you could use raisins, sultanas or chopped dried apricots. This is the sort of dish that would go with lots of different wines, but I would suggest a great match would be an oaked Chardonnay from Australia, New Zealand or Chile. Alternatively a fruity rose from the South of France or Spain would also go well here. In need of a gorgeous vegetarian Christmas main that is easy to make and can be prepared in advance? 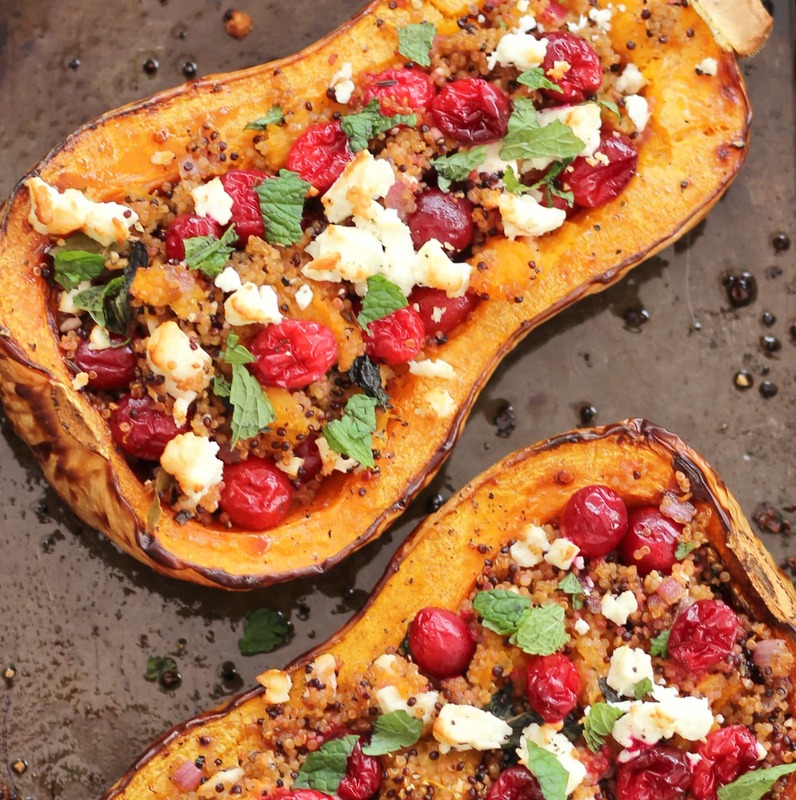 This Cranberry, Feta and Quinoa stuffed Butternut Squash could be exactly what you are looking for! It’s also gluten free, can easily be adapted to make it dairy free and is chock full of goodness!! Cut the two butternut squash in half lengthways and remove the seeds using a spoon. Drizzle with a little olive oil, sprinkle over some salt and pepper and roast for 1 hour in your preheated oven. About 10 minutes before the butternut squash is due to come out of the oven, gently fry the diced onion in 2 tablespoons of olive oil for 5 minutes, then add 2 teaspoons cinnamon and 2 teaspoons cumin and fry for 1 more minute. Add the whole pack of Merchant Gourmet quinoa and stir to coat the quinoa in the onions and spices. 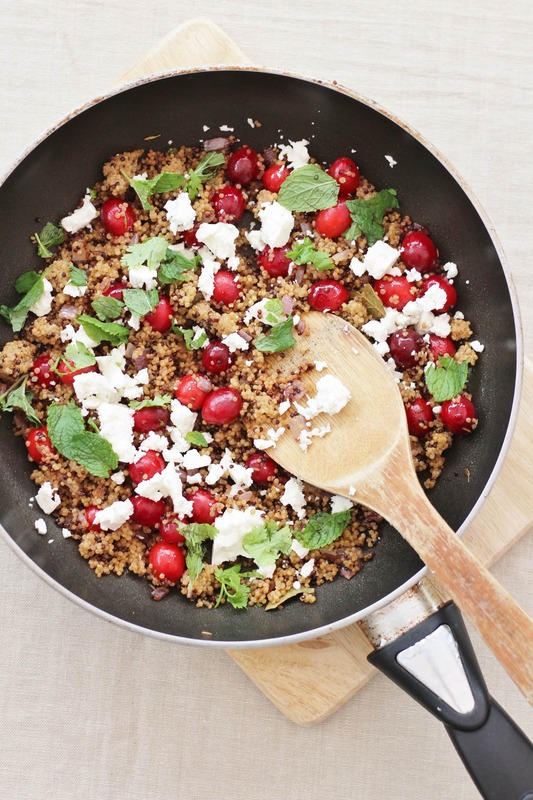 Turn off the heat, add most of the cranberries and feta, and 2 tablespoons of chopped mint and stir gently. 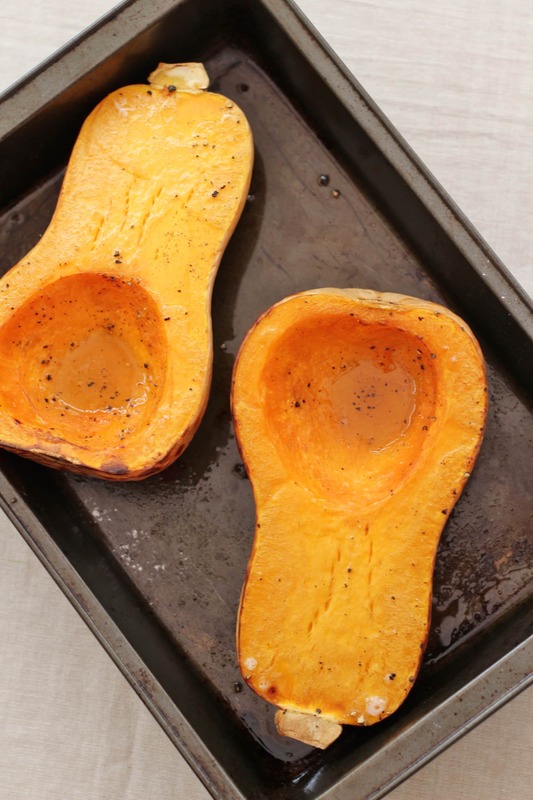 Take the butternut squash halves out of the oven and scoop out the flesh, leaving a ½ cm border. Roughly chop the flesh and add it to the quinoa mixture. 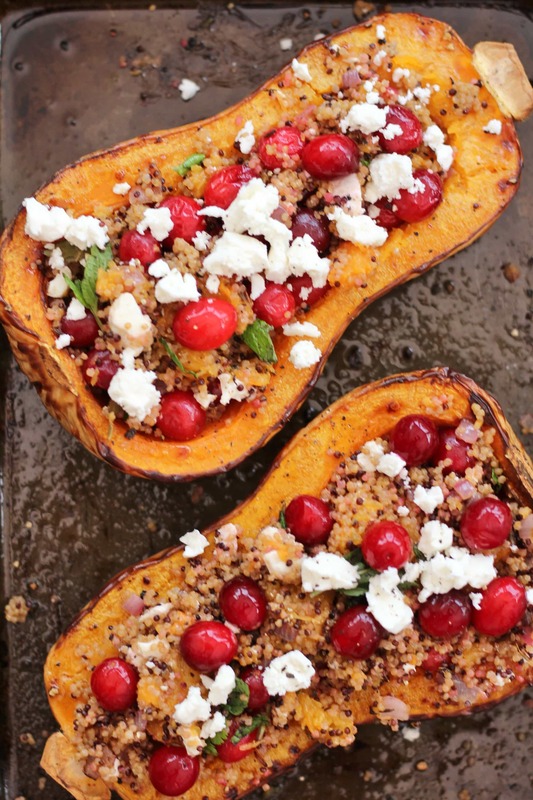 Fill the butternut squash halves with the quinoa mixture and top with the remaining cranberries and feta. 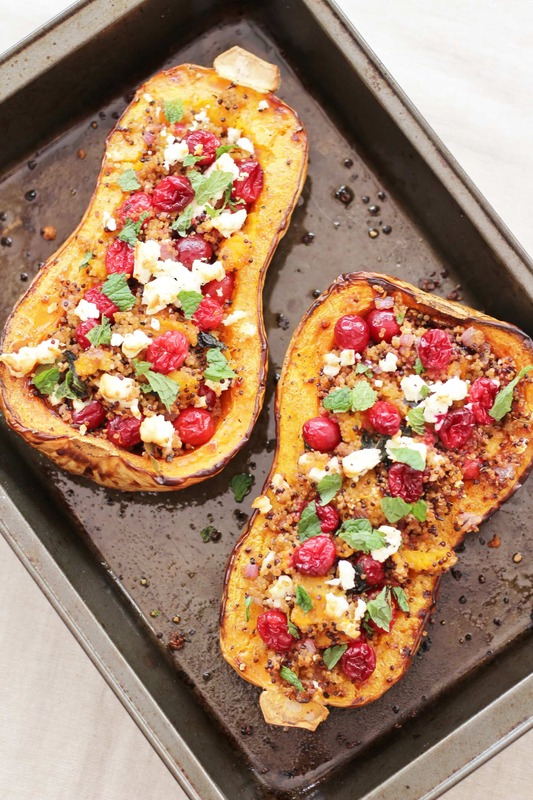 Cook the stuffed butternut squash halves for 10-15 until the feta is brown on top and the filling is warmed through. Sprinkle with extra mint and serve. This Cranberry, Feta and Quinoa stuffed Butternut Squash is also a great make-ahead recipe, because it is really easy to reheat the next day. Simply place the stuffed butternut squash in a cold oven, turn the oven up to 180 and heat for about 20 minutes until piping hot all the way through. Hi ed, this does look and sound appetizing. I am always on the lookout for new ways of eating vegetables and would never have thought to stuff a butternut squash. We do eat meat so this would make a nice side to some meat. We don’t get fresh or frozen cranberries here, do you think soaking dried cranberries would work in the recipe? WOW! 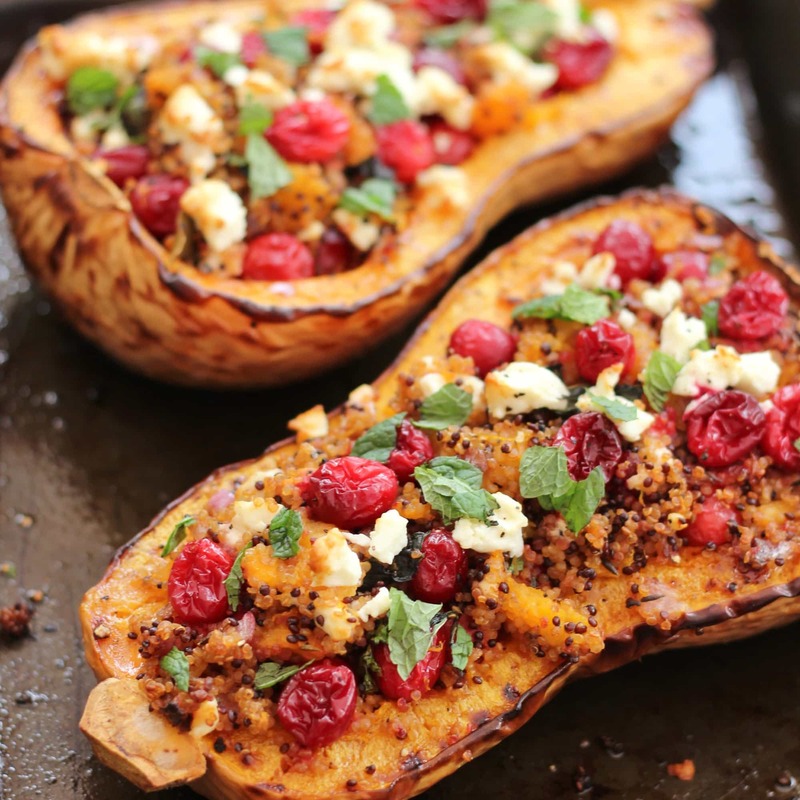 So much incredible flavor you got going on in this delicious looking stuffed squash! This is perfect for the holidays! This is like a pretty little delicious boat of winter. LOVE all of these flavors together! You’ve got a good one here! 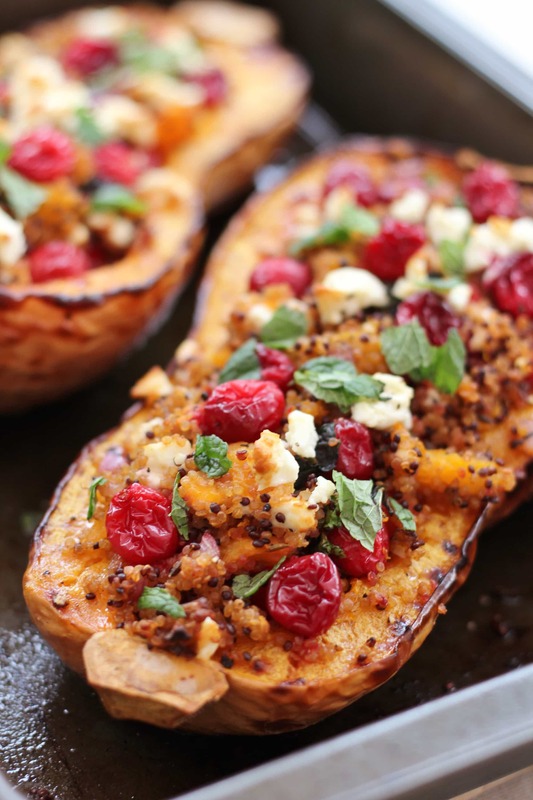 Your butternut squash looks delicious Eb, I love the idea of adding cumin and cinnamon to the quinoa. I bet the salty Feta and sour cranberries add a real depth of flavour. The colour of these is absolutely gorgeous, it almost seems a shame to eat them! Although they sound delicious too. I’m looking forward to seeing what you get up to with those chestnuts as I have a half open pack in the fridge to use up, at the moment they’re destined to be roasted with some sprouts. Forgot to say… ordered a couple of packs of the chestnuts from Merchant Gourmet just yesterday. Great minds think alike! Oh my gosh! This looks amazing. My mum and step dad are veggie so I may well do this on Christmas day to make a change from nut roast! Lovely. Thank you! What a delicious looking veggie meal. I would be delighted to have this for my Christmas lunch or indeed at any time! I really love the look of this, what a wonderful recipe! Pinning for later!